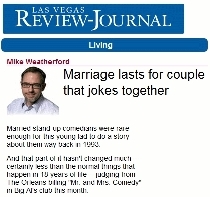 The Comedy Bible: Brian McKim & Traci Skene featured in the Las Vegas Review Journal! Brian McKim & Traci Skene featured in the Las Vegas Review Journal! Brian McKim & Traci Skene, authors of "The Comedy Bible: The Complete Resource for Aspiring Comedians," were featured in the Las Vegas Review Journal! Click here to view or download a printable 8.5 X 10 .pdf version of the article! BRIAN MCKIM and TRACI SKENE are the authors of "The Comedy Bible: The Complete Resource for Aspiring Comedians," published in 2011, by Barron's Educational Series (U.S. and North America) and Quintet Publishing Ltd. (U.K. and Worldwide)! For fifteen years, they wrote and published SHECKYmagazine.com, the WWW's most beloved magazine about standup comedy. Brian has appeared on "Late Late Show with Craig Ferguson" and was a semifinalist on Season 7 of NBC's Last Comic Standing. He is a writer and professional standup comic! He has also appeared on numerous network, syndicated and cable TV shows and on "The Bob & Tom Show." Traci was featured on Season 7 of NBC's Last Comic Standing. She is a writer and professional standup comic! She has been one of US Weekly's Fashion Police since 2001. She appeared on VH-1's "Fools for Love," "VH-1's Standup Spotlight," and A&E's "Comedy on the Road." Her book, "Sometimes Ask A Man" hilariously skewers traditional social and sexual mores as well as modern feminism and is available on Amazon.com. "Comedy Couple Compile Book of Funny Advice"